For advanced understanding, please read native_osx in depth. Native-OSX is a combination of two concepts, OSXFS only and Unison together. We use OSX to sync the file-system into a sync-container to /host_sync. 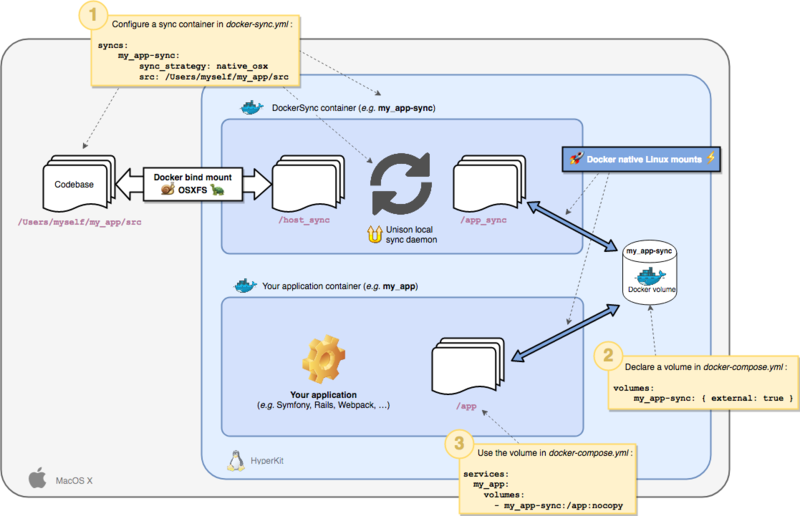 In that sync container we sync from /host_sync to /app_sync using Unison. /app_sync is exposed as a named volume mount and consumed in the app. You ask yourself, why? Its fairly simple. By having this extra layer of unison on linux, we detach the actual write/read performance of your application from the actual OSXFS performance - running at native speed. Still, we using OSXFS, a about up to 1 second delayed, to synchronize changes both ways. So we have a 2-way sync. What is different to plain Unison you might ask. The first big issue with Unison is, how bad it performs under OSX due to the bad FS-Events of OSX, implemented in macfsevents and alikes. It uses a lot of CPU for watching files, it can lose some events and miss a sync - but also, it adds extra dependencies on the OSX hosts. All that is eliminated by native_osx - we use Unison in the Linux container, where it performs great due to inotify-event based watchers. This strategy has the biggest drive to become the new default player out of the current technologies. It seems to work very well with huge codebases too. It generally is build to handle 2 way sync, so syncs back changes from the container to the host. The daemon on OSX needs extra care for sleep/hibernate. On initial start, Unison sync needs to build a catalog of the files in the synced folder before sync begins. As a result, when syncing folders with large numbers of relatively large files (for example, 40k+ files occupying 4G of space) using unison, you may see a significant delay (even 20+ minutes) between the initial ok Starting unison message and the ok Synced message. This is not a bug. Performance in these situations can be improved by moving directories with a large number of files into a separate rsync strategy sync volume, and using unison only on directories where two-way sync is necessary. This strategy is probably the simplest one and probably the most robust one for now, while it has some limitations. rsync-syncs are known to be pretty fast, also working very efficient on huge codebases - no need to be scared of 20k files. rsync will easily rsync the changes ( diff ) very fast. You find the available options for each strategy in Configuration.